CTI’s translation team is composed of a researchers and experts from a wide variety of industries and academic disciplines. Our translators are native Mandarin or English speakers who hold advanced degrees from elite American and Chinese universities. To ensure the quality of each translation, CTI developed an internal matching system to assign our client’s material to translators with relevant backgrounds including, but not limited to: financial, accounting, legal, marketing, science, technology and engineering. Their skill and experience ensure that your work is translated and edited into precise, professional and publication-ready language. 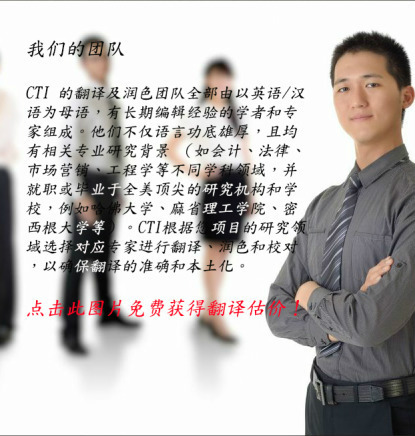 Each CTI translation is edited by a team of native Mandarin and English speakers, with specialist expertise in the relevant field of study. The result is a precise translation that is accurately interpreted and structurally elegant.